Boston 1775: “Speak Out!” at Old South, 27 Mar. “Speak Out!” at Old South, 27 Mar. On Wednesday, 27 March, the Old South Meeting House will host the fifth annual “Speak Out!” commemoration of the annual Boston Massacre orations, co-sponsored by the Bostonian Society. Each year from 1772 to 1775, massive numbers of men, women, and children gathered here at Old South Meeting House to commemorate the anniversary of the Boston Massacre, with rousing speeches by John Hancock, Benjamin Church, and Dr. Joseph Warren. Join us to hear excerpts of these speeches, performed by an inter-generational group in the same hall where the orations took place 240 years ago! This year’s program will include excerpts from the “Crispus Attucks Memorials” delivered in 1858 by William Cooper Nell and Dr. John Sweatt Rock, which zeroed in on the institution of slavery in relation to the rhetoric of liberty. This occasion isn’t just for listening to speeches, though. Audience members can choose to read selected excerpts, and the most rousing orators in youth and adult categories will receive prizes. This event will start at 6:00 P.M. It is free and open to the public, but Old South asks people to register here. 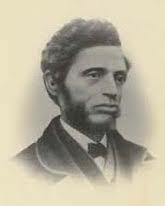 The picture above shows William Cooper Nell (1816-1874), who in addition to being one of Boston’s foremost civil-rights activists in the mid-1800s was also a Revolutionary War historian.